Good afternoon everyone! I'm sharing with you today, my first tutorial! Yay! I am showing you how to stamp, color and assemble the mini skinny card and the manger nugget holder pictured at left. The Jesus Nuggets is a set that is releasing tonight at Clear Dollar Stamps. A photo of a full gift ensemble idea which includes these 2 items is at the very end of the post. 4. Color your paper with the hay and medium brown copic markers as shown below. 5. ABOVE - Start blending the yellow and brown by working the yellow down.....the key is to get enough ink on the paper to make the colors start blending. Just keep coloring down from the yellow until your colors start blending....this really does take practice, so keep working with it! 7. Keep coloring and blending with your markers until you have a blend you like. 8. ABOVE - This is what your piece should look similar to. Now it is time to start erasing the center to stamp your words! 9. BELOW - Using your copic blender pen, start at the center of your opening making a small circle. The blender pen works like an eraser....it will keep pushing the ink back as you make your circles in the middle, eventually leaving your white space. Let it dry COMPLETELY (a note from the experienced) before you stamp your words in the center! Fold long brown cs in half, attach sewn piece to front of card with dimensional pop dots, attach colored piece on top with pop dots at the far ends. Run ribbon under the colored piece and tie a pretty knot. Stamp and color baby Jesus and cut out. Apply pop dots to Baby Jesus and attach to front of the card with the baby's head over the knot. 1. Stamp another piece of white cs with the hay and Baby Jesus (BJ for short). 2. Color in his face with the flesh color. 3. Color along the bottom ridges with the dark blue, then color over with the light blue apply ink liberally to cause the colors to blend. 4. Take the medium brown and color around BJ leaving a slight rim of white around BJ so if the inks push a little while blending, BJ doesn't end up brown! 5. Using the same blending as the mini card panel, starting working the yellow into the brown until the "line" disappears between the brown and yellow....gradually work yellow out to end. 6. If you don't feel your blend goes out far enough, you can add a few streaks of brown, then applying medium pressure with your brush, begin working the lines with your yellow until they blend between the brown and the yellow. 7. When done blending, carefully fill in the white line around BJ with dark brown marker. 8. Wrap around your nugget and move on to the manger assembly below. 1. ABOVE - Stamp each plank twice on Neenah white cardstock using Memento ink. Trace a line around your manger template that comes with your Jesus Nuggets stamps on the same cardstock. 2. With the darkest shade and a medium shade of browns add some lines to all planks, approximately as shown above. 3. Using both the lighter medium brown and a very light brown, blend over the planks completely as shown above until the desired wood grain is achieved. 4. Cut out the 4 planks, as closely trimmed as possible. Stamp the appropriate shaped planks on the backside of the cut out planks. Apply the same colors as in step 2 and 3, to the backside of the planks. This will create a plank that looks like wood on both sides. Set these aside while working on the manger holder. 5. Stamp in Memento ink as shown in the picture above. Mask off the first stamped plank by holding a sheet of copy paper or post-it note over it, in order to stamp the final plank. Cut out on the traced pencil lines and stamp the planks again on the back side of this square. 6. Completely cover BOTH sides of this square with the medium brown copic marker. TIP: Leaving it a little uneven will help the manger look more like real wood. 7. Referring back to your template for the manger base for where to cut and how far in (approximately 3/8"), cut the 4 slits in each corner of the square so that you can fold it up. 8. Fold the flaps in and then each side up. 9. Using double sided red sticky tape on each flap, carefully stick each corner together to form the bottom half of a box. 10. Using double sided red sticky tape, size and cut pieces to stick 2 planks together at an angle, and make 2 sets of those. LASTLY, use double sided sticky tape to stick the 2 sets of criss-crossed planks onto each end. All coloring is with copic markers on Neenah white cardstock. Supply list for card and manger are listed at the top of this post. The clear box fits 8 nugget candies perfectly and can be purchased HERE. Thanks so much for viewing my tutorial and I hope it was helpful! Many Blessings! I've FINALLY made it in to the BLOG WORLD! Hello everyone! My name is Lori McCroskey and I've finally made it into the blog world! 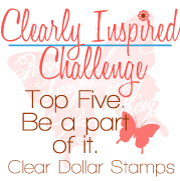 I am going to be using my blog to announce my company news, blog candy, Design Team calls, post ideas, and much more about Clear Dollar Stamps and basic stamping hints for photopolymer (clear) stamps! I'll be posting my projects, tutorials and templates, and I even hope to have some of my Design Team members contribute tutorials and other helpful hints as well.